LifeCraft Asia — 'MMA fighter' fail to assault petite security officer. 'MMA fighter' fail to assault petite security officer. Lately a MMA practitioner assaulted a security officer that lead to a minor scuffle that got him apprehended by the security officer. He was trying to gain access to a condominium to collect his debt from a “friend”. The security officer take responsibility to his job to not letting unauthorized entry to the residency for safety. The man having his frustration gotten over him started to argue with the security guards who rejected his demands for access. As the argument got heated, things turned to worse where the guy initiated an attack by heavy lower kick to the security officer. 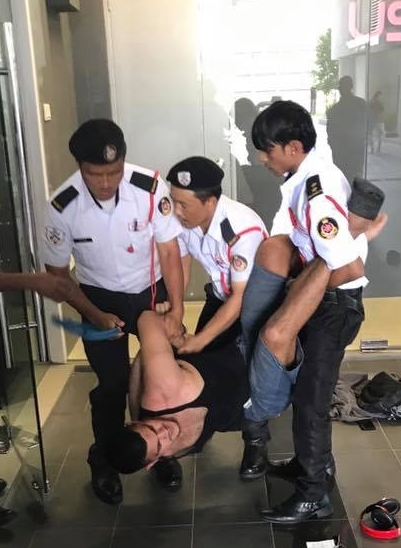 Fortunately, the security officers did a great job by controlling the the man to avoiding unnecessary critical situation happen. In every kind of martial art character should have been taught to be disciplined and not use the skills gained to harm others with unnecessary circumstances. They could have use it to protect their life or family from harm's way but not use it to bully or endanger other personal safety. These techniques could also be used on stage or in the competition under supervision from referee or judges. but not to use skills to attack others without a proper reason or bully. A true Martial Artist is been taught to respect each others, discipline and be humble.